I had a hankerin' for some vittles, so I saddled up old Legacy and rode on over to the general store. While'n I perused their stock for something tasty, I came a across this here pink bag of Cowgirl Bark—my left eyebrow lifted up like one o' them there hot air balloons. I'd only ever heard of such a thing once before, in the classic western writings of a Mister Russell Shelly—a legend 'bout a man by the name of Cowboy Joe—a man so ruggedly adventuresome that the mud scraped off his boots made an unusual snack for regular folk like you and me. And while some say it ain't such tasty eatin', others say Cowboy Joe's mud is the stuff of dreams—more still say he's a lost man; a man with good intentions, yet a drifter with a broken compass. I had to find out if his cowgirl counterpart was just as unhinged, or if the bark from her boots were something just a little more special. I sauntered over to the clerk, an impish young lass by the name of Josephine—Trader Jo, they called her—and placed my wares on the counter. She eyed me coolly. "You know they sell Cowboy Bark," she quipped. I stood there for a moment, eyeing her in return, taken slightly aback by the affront to my masculinity. "I've heard of it," I said. We stared each other down like gunslingers at high noon. She picked up the bag. "You like white chocolate?" she asked. Now, it's well-documented in these here electronic logs that I'm a huge fan of white chocolate. "It's for my wife," I lied. At least on most occasions, the little missus prefers dark chocolate to white. As Trader Jo shot me a look of disbelief, I went ahead and conceded "But I'll probably eat half the bag...and yeah, I do like white chocolate," as if the confession would offset my untruth. And with that, I quick-drew my wallet out of its holster, clicked the plastic action down through the reader, punched the green button, and laid that transaction down in no time flat. I snugged the card back in its sleeve as Jo handed me a receipt. Impressed by my skills with the plastic, she waved me aside from the checkout, sat me down on a barstool, and took off one of her boots. It was covered in white mud, with a conglomeration of brown and red clay caked below her spurs. It was her. She was Cowgirl Jo. "Me 'n Cowboy Joe used to ride together," she said. "We'd rustle almondolopes as a team." She could tell I was impressed. "We both set out for the Big Rock Candy Mountains together, but...well, we both got a little lost along the way." She continued, "I was with 'im through Pretzel Prairie, all the way past Peanut Pond..." she trailed off and got a little teary-eyed. "And then, I—I just had to follow my own heart. We went our separate ways when he went up Joe-Joe's Mountain. I continued south through the Ginger Hills, and eventually I came upon a field of Cranberry Cattle. I wrangled them up and returned 'em to Rice Ranch." As she recounted each leg of her journey, she showed me the corresponding ingredient in her "bark." Triple ginger cookies, dried cranberries, and Rice Krispy-like grains were all tasty ingredients, but...where was she headed with all this? "Finally, I wound up on the Great White Flats of Chocolate," she said. "I have sweet, sweet memories of that place." Glancing round her store at that point, she noted that it had filled up with locals and dudes, so she excused herself and sent me packin'. 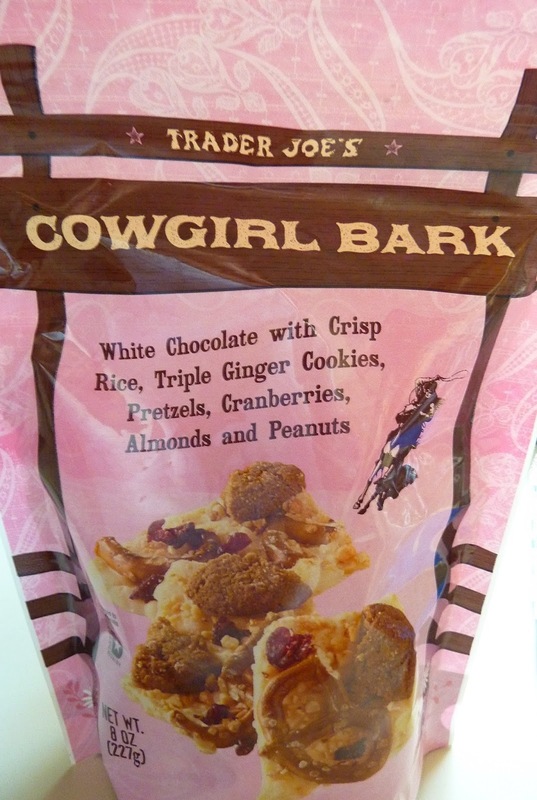 My encounter with Cowgirl Jo resonated with me for hours as Legacy and I lugged our goods back home to the missus—who surprisingly enjoyed the Cowgirl Bark more than I did! Sweet as Cowgirl Jo was, I still think she's just a-wanderin'...out there driftin' in the wilderness, just a bit lost like a tuft of tumbleweed. 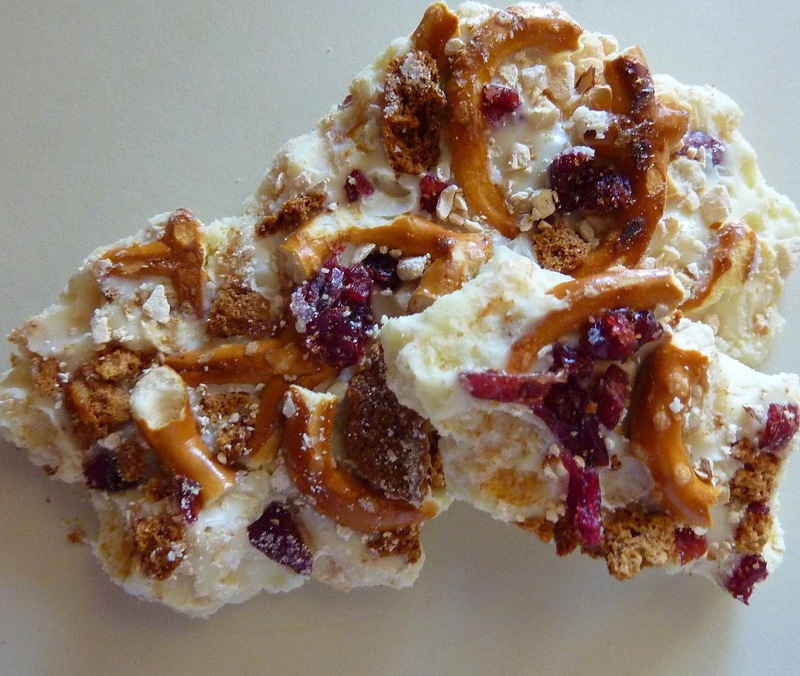 But if'n you like white chocolate—and ONLY if'n you like it a lot—then I say this Cowgirl Bark is worth a whirl. I give it three Sheriff Stars. The missus gives it four. dying. absolutely dying laughing over here! Despite the cocoa butter, white chocolate is an oxymoron. Yeah, I guess white chocolate isn't very chocolatey...but it's still tasty! That was glorious, sir! So funny! Maaaan, if only I was in a bigger store, I'd build some kind of awesome display with a chalkboard depicting the scenery you described. This product is a bit, er, controversial in my store. A lot of my coworkers think it's sexist to call it that and have the bag be pink, but eh...This is what TJ's does, right? The pink thing is a bit of a stereotype. Do I smell a class-action lawsuit coming on? THAT is an excellent suggestion!